There are likely to be readers of this page who will know more about this family than I currently do. Hopefully, I will hear from you and be able to correct any errors. Two things recently reawakened my interest in the JULIUS family. 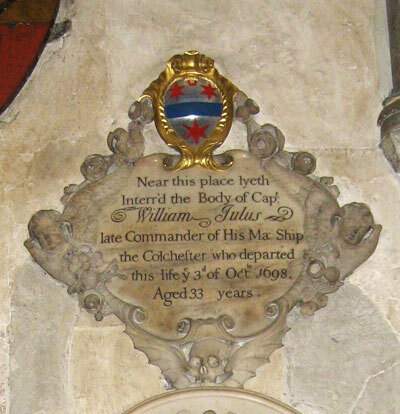 The frivolous reason is that when I was watching the wedding of Prince William and Catherine Middleton at Westminster Abbey, I was reminded of the William JULIUS (1665-1698) who was buried in the Poet’s Corner at Westminster Abbey. The second reason for my interest in this William JULIUS was that he was a great-great uncle of Amelia Lydia Dare, wife of Sir Thomas JACKSON. The more I learn about Amelia and her family, the clearer it becomes that their business connections were a significant part of Jacksons’s success in making HSBC such a major player in the late 1800s, and laid the ground for their successes in the 20th and 21st centuries. Much of this tree was compiled by Wendy Jack, who shared it with me several years ago. I have added to it since then, and am grateful to all of those who made their various contributions. I continue to be more than happy to make any corrections to errors that I may have committed. NOTE: At this point, I am not going to annotate all the names in the tree beneath. Details on them can be found on my Rootsweb tree, which I will update on a regular basis. It is easier for me to do that than to continually refresh this version of the tree. For now, I have footnoted the names of the most interest to me – partly because these are names where I hope to learn more from others - and have bolded them so they are easy to pick out. 1 John Julius b: Abt. 1610 of North Yarmouth, Norfolk, England. NOTE: This birth date is an estimate, based on the birth of his eldest known son. The earliest records of the JULIUS family are in the Records Office, Fetter Lane, London. In 1668 one John Julius was paid a Sum of money by the King to bring himself and family from North Yarmouth to St. Kitts. from “Julius jottings” January 1902. In 1880 I chanced to be in the record office at Fetter lane and came upon this notice that in 1668 one John Julius to take himself and his family to St. Kitts -- it is supposed that this JJ is the person referred to in the genealogical table which was in our last issue and whose date is given as 1726. This brings the family considerably further back from 1726 to 1668 – editor SOURCE: Notes by Amy Oliver LLOYD (1874-1962). This has been corroborated by the same record – see beneath. I am unsure which John Julius is being referred to, but I suspect the elder. John JULIUS. NOTE: The birth date and place for him is from an Genforum posting which gave no source. · Jackson's Oxford Journal, Oxford, England, 12 July 1823. Death notice (hereafter cited as Death Notice, Jackson's Oxford Journal). Calculated birth year. Age given as 100 yrs at death in 1823. NOTE: Her daughter, Jane Smith JULIUS wanted to be buried in the same graveyard, the Tabernacle burying Ground - I assume in Bristol, England. · BRITISH NATIONAL ARCHIVES: Captain W. Julius, the Chester at Sheerness. He has made out tickets for the men discharged to the Royal Katherine, but she sailed before they were ready. Should he send them to London or to Captain Goather at the Downs. Item reference ADM 106/484/145 Captain William Julius, the Chester, Plymouth Sound. Reports his arrival with four merchant ships bound for London from St. Christophers, has sent books to Clerk of the Cheque, a list of clothes sold laid in by Captain Samuel Horne and Thomas Long, merchant at Antigua, and requests provisions and stores to proceed to the Downs. Item reference ADM 106/490/130 NOTE: There are a number of other such references, but so far, I cannot find his will on line at the National Archives. · Little is known of Julius’s life and career other than that he had commanded HMS Chester and later HMS Colchester in the West Indies, where he died of fever. John JULIUS John Julius, President of St. Christopher. Mary WHARTON. WHARTON was one of the first plantation families of St. Kitts. Thomas WESTCOTT: In the will of his wife's brother William JULIUS - the rest of the estate was left to his sister Elizabeth, wife of Thomas Westcott of St Kitts.